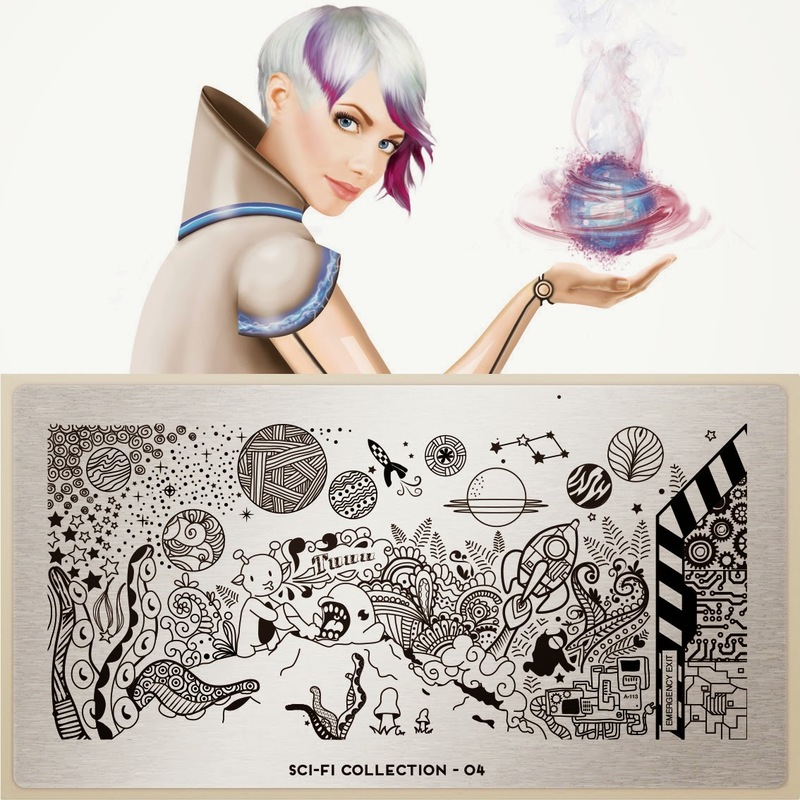 Lacquer Lockdown: Hot Off The Stamping Press: MoYou London Sci-Fi Collection Expansion! 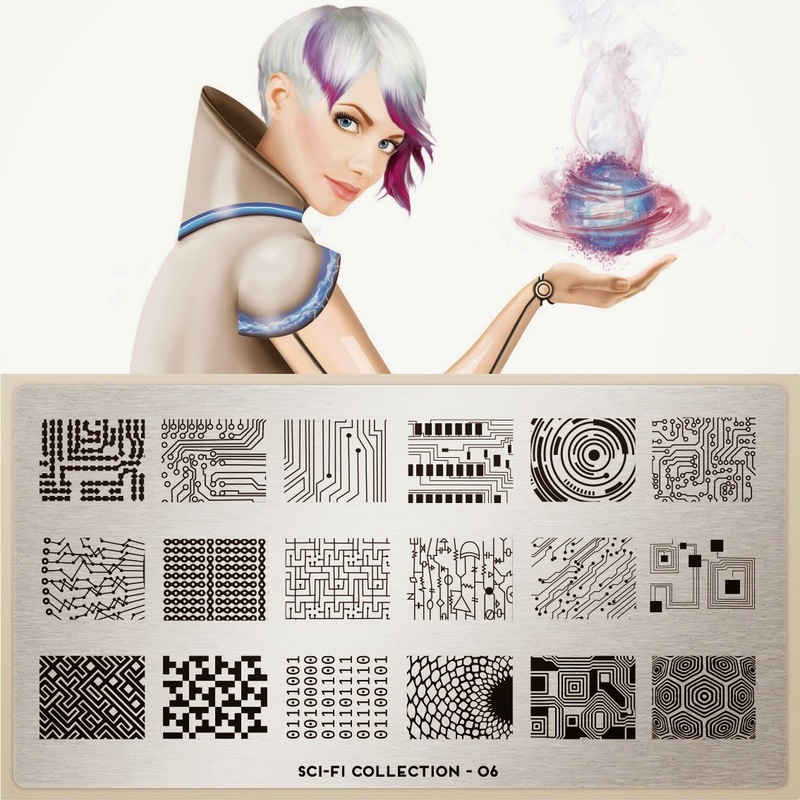 Hot Off The Stamping Press: MoYou London Sci-Fi Collection Expansion! Again this is the mascot of the collection Lelu she's very well designed and gives a good feel for the collection overall. 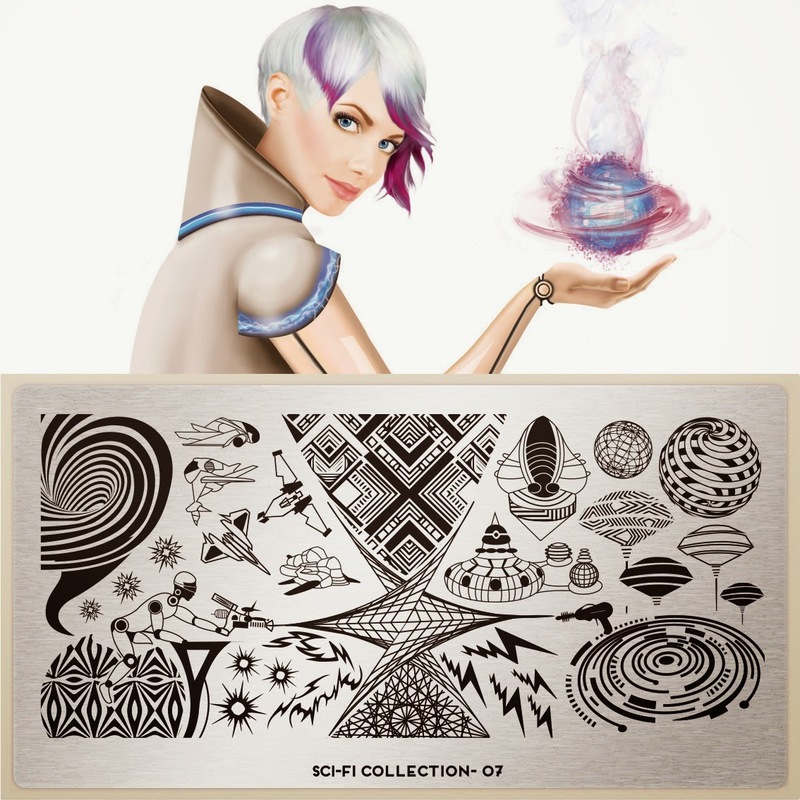 So MoYou goes big right out of the gate choosing to set off the expansion with one of their infinity style image plates. This one for me is a swing and a near miss. First, the imagery is woven together beautifully. MoYou are really experts of their craft, and this allows them to tell a story from one plate skillfully. The near miss comes from the fact that once again these images are very cartoonish when what I want is the Matrix on crack mixed with Moulder, Scully, and a little John Luke Picard thrown in for good measure. Alas! I will say it works well here though because everything is set together naturally. Digital imagery. Better - I'm intrigued as its as step closer to what I wanted. I will say though I have seen this type of image before on Messy Mansion plates, Bundle Monster plates, and Winstonia plates if I'm not mistaken. The second image from the right in the upper row is unique as is the one directly below it and in the far left lower hand corner. Well played. Novel enough that I'd want the plate in it's entirety to get these images. Don't flip out and think they are being lazy and duplicating things (lol I did that at first). This is MoYou's way of catering to the shorter nail crowd - which is me these days. Smaller images than the XL counterparts with a few bonuses mixed in for good measure. Same issue though with the mix of previously seen images and novel ones. However, this plate has more novelty than its counterpart. The last plate is the best in my opinion moving closer to what I had envisioned when this collection first released. On a whole this is very I, Robot. And since I adored Will Smith, his dripping muscles, and his robot friend Sunny it's a win for me. Specifically the images in the middle of the plate are killer! So here I am sort of borderline with a MoYou release. What do you guys think? I like all of these plates better than the ones that initially released for this collection. I like them enough that I'd get all of them, but I still want to see this collection explode off the plates. If you think about the Greek Mythology Collection you'll get a feel for what I mean. 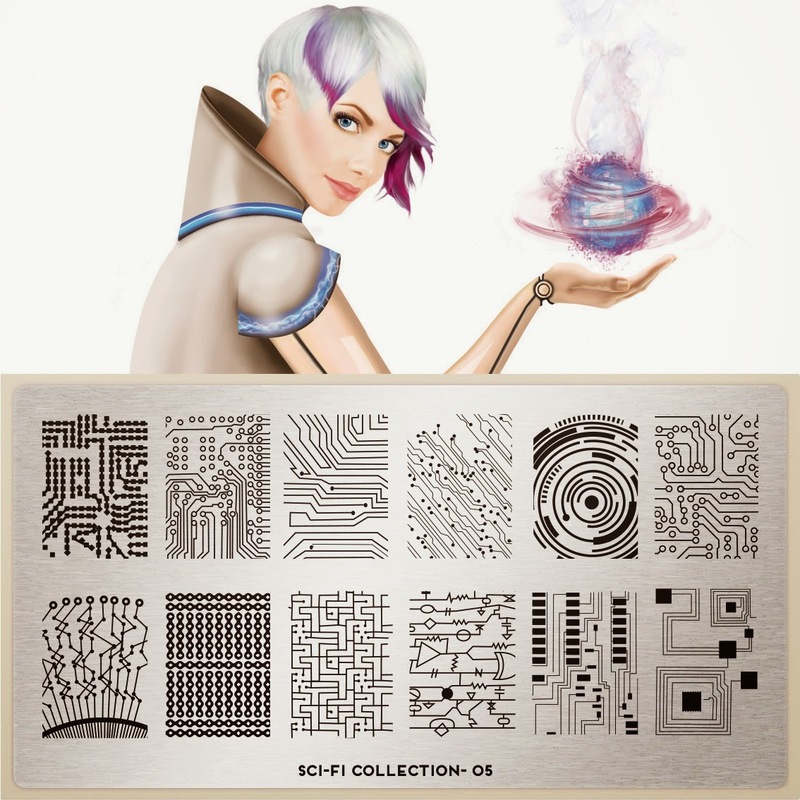 Every plate in that collection is a winner and intriguing. These are sort of getting there. I will say I'm enamored enough to keep watching, but perhaps it's time to lower my expectations. So as usual these plates retail for 4.99 Euro per plate and will be available on the MoYou London website tomorrow morning. Thanks for reading and I'll see you next post!